The top-ranked University of New Hampshire football team is set to begin its playoff run this weekend. The Wildcats will host Fordham University Saturday afternoon in the second round of the NCAA D-1 Football Championship. Head coach Sean McDonnell joined Morning Edition from Durham to reflect on the season and preview this weekend’s playoff matchup. After just a single loss in the first game of the season, you ended up with a string of 10 wins. Can you recap this spectacular season? The first game was a very difficult game for us against Toledo. On the road, against a very good team. We knew we had to play well to win. We were in the game for a little bit of the first half, but they took it to us very good in the second half, so we ended up losing that game. We knew that the next two or three games were games where we had to rebound. One of the most important games was the Richmond game on the road. We went down there and we won, scoring with about 25 seconds to go in the game. The great thing about that game was our starting quarterback Sean Goldrich had a heck of a game, but got hurt on the second to last drive of the game and we had to replace him with Andy Valais in the last drive of the game. Andy drove us down the field and scored. It was just a great team effort and a great win on the road. And then coming back up here against William & Mary at homecoming. Another great team, another top 25 team. We played at home in “The Dungeon” in front of about 16,000 or 17,000 fans and we had probably our best game of the year overall. It’s really when we got to the middle of the season when we felt we could be a good team. You’ve got home-field advantage in the playoffs at Cowell Stadium, a field that’s been called “The Dungeon.” What does that mean for your players to have that home-field advantage? They love playing in front of our hometown fans, in front of the student section, and representing New Hampshire. We’ve been getting great support over the last three or four years and this year, it’s been just unbelievable with the lights, with the crowds that we’ve had. It gives us an uplift. We’ve always liked playing here, we’ve always done well here. It’s just the energy and excitement of being back home and being in front of our fans that makes it special. As you head into the game this weekend, do you feel good coming off some of that downtime with that bye week? Do you feel like the team has lost any momentum? We’ve been through this before. We’ve been in the playoffs and we’ve played in the first round and we’ve also had byes. The biggest thing for us is we came back on Sunday and practiced. I thought the kids were pretty sharp. We’ve had two good practices. This is a good team coming in here in Fordham. Everybody I like to say has got their antennas up. This is a huge game against a good team. Some rain, maybe some wet snow in the forecast for Saturday. Does that worry you at all? No, the only thing I worry about is wind. That really takes away a lot of the kicking game, a lot of the passing game. With the artificial turf we have up here now, the field turf, there’s not the mud, the sludge, the puddles and everything. The biggest thing is keeping the ball dry and I think the people on the sidelines will do a great job of doing that for us. 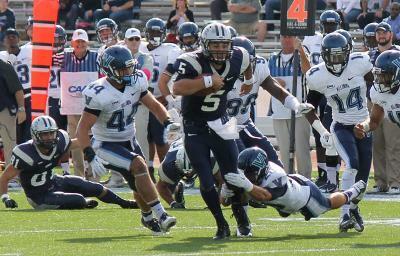 The top-ranked University of New Hampshire football team is set to begin its playoff run this weekend. 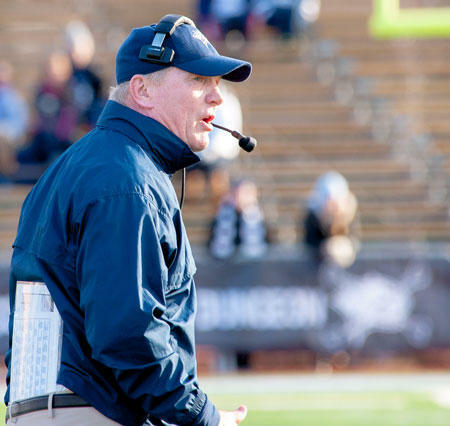 Listen to Rick Ganley's interview with UNH football coach Sean McDonnell. The University of New Hampshire football team is heading into the playoffs as the number one seed. UNH clinched the Colonial Athletic Association title this weekend, defeating the University of Maine on Saturday, 20-12. The title, the school’s first since 1994, earned UNH an automatic bid into the NCAA Division 1 FCS Football Championship. UNH was awarded the number one seed on Sunday, giving the team a first-round bye. UNH will host either Fordham or Sacred Heart at Cowell Stadium in Durham on Saturday, Dec. 6. Football faces increasing criticism as mounting evidence shows the dangers of concussions, in particular undiagnosed concussions. A new telehealth initiative at Dartmouth College aims to eliminate those undiagnosed concussions by bringing neurosurgeons to the sidelines--via robot. On the sidelines of the Dartmouth/Penn football game, neurosurgeon Robert Singer watches carefully. "A lot of these hits are shoulder hits. What we’re looking for are direct head to head kind of contact, that type of thing."